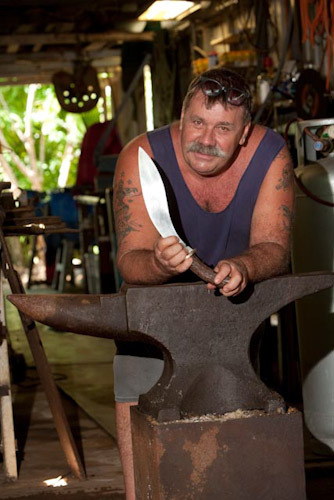 Life for a blacksmith in the tropics is far from cosy but Steve Sunk's passion for making bladed weapons rises above discomfort. 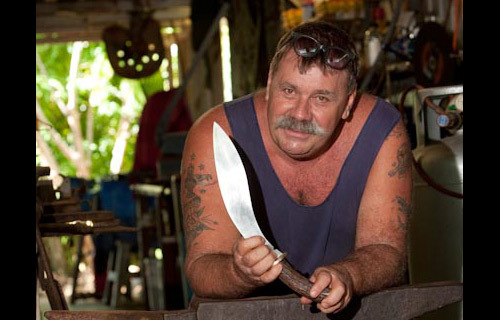 He sometimes spends days in his shed producing a remarkable and intricate knife. 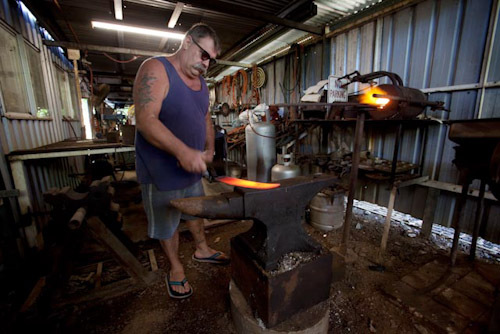 If he is working on a sword, he could be hammering away for up to three months. 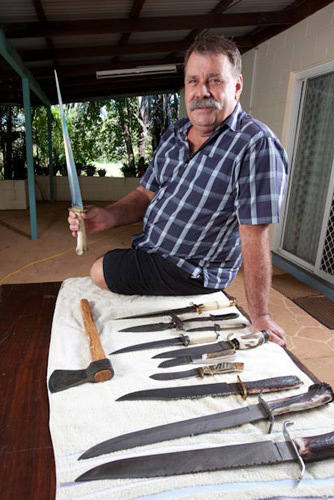 "I make different knives but by far the most popular are the large Bowie knives and skinning knives that hunters use for pig and deer hunting in Australia," he says. 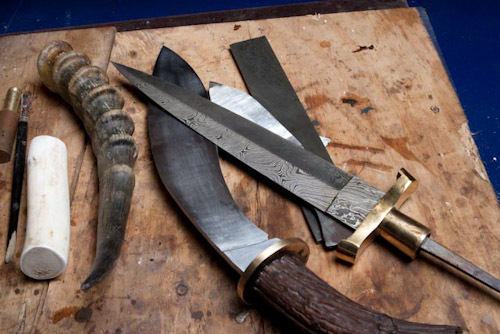 "They also like a small axe with a spike on the end." 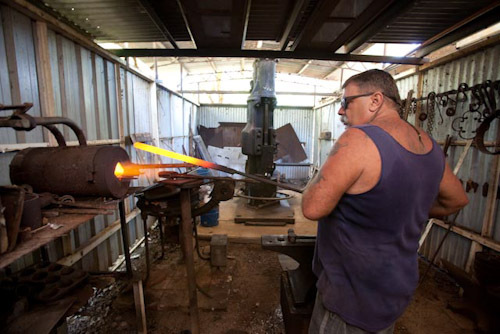 "Forty per cent of my work goes to collectors from around the world, primarily the United Kingdom and the USA. 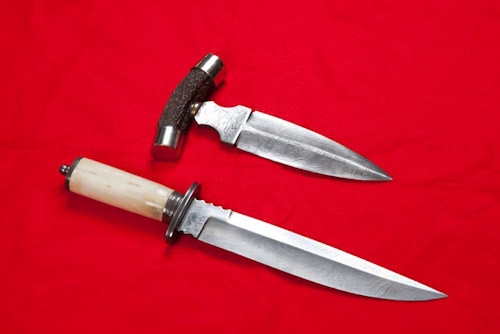 I create one-off pieces such as daggers and swords. 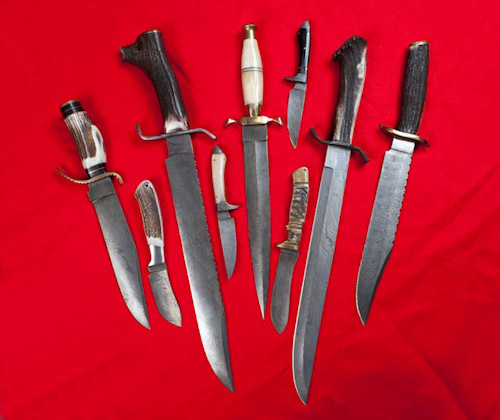 The swords are double-edged in the English style or samurai swords in the Japanese style. 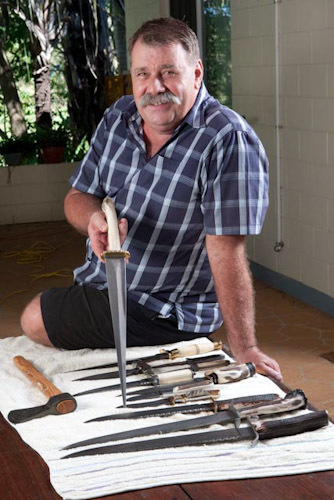 I recently completed a ceremonial sword for the Singapore Consul-General." 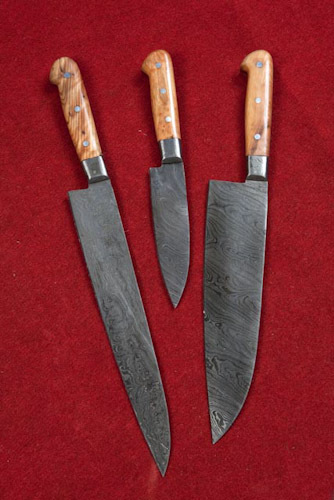 Steve also makes chef's knives in traditional French and Japanese styles. 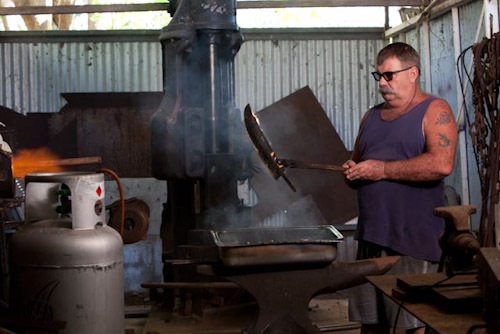 "Chefs are a miserable lot," he complains, jokingly. 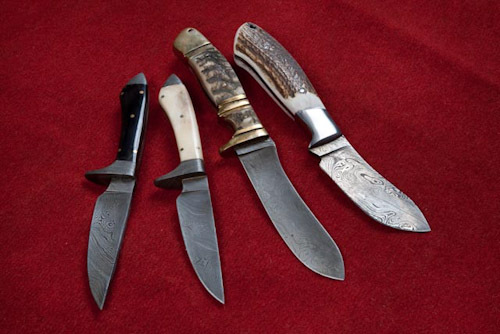 "They love my knives but won't pay $800 for a set of four so I concentrate on collectors and hunters." 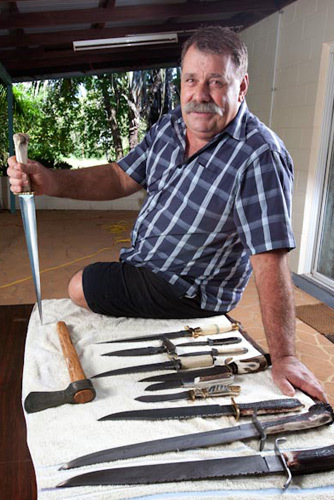 Steve also makes a sniper's axe and combat knife, popular with Special Forces troops in Afghanistan, however he won't talk much about those except to say they are "really tough" and have proved "useful" in hand-to-hand combat. 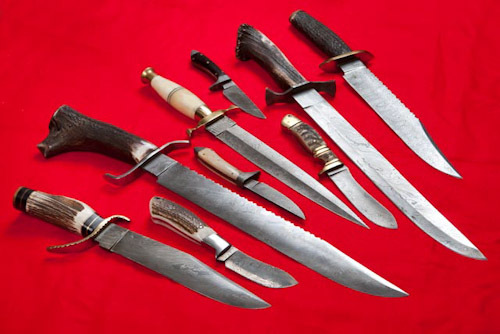 All of Steve Sunk's bladed weapons are made from Damascus steel, the legendary metal first forged in the Middle East that struck fear into the hearts of Crusaders because of it's durability and hardness. 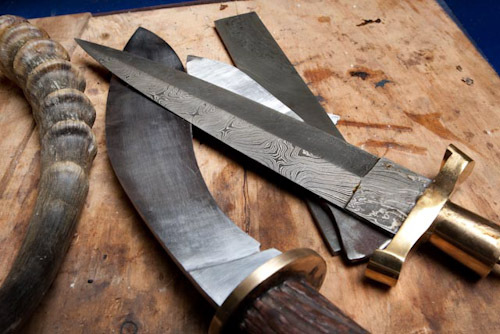 A single blade can be folded hundreds of times before it is made into a weapon. 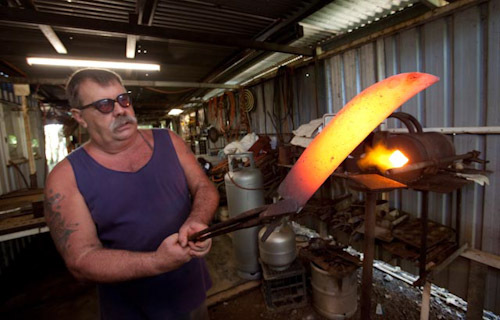 "I mix two or three different steels in the forging process and all are carbon steels, not soft steels," he says. 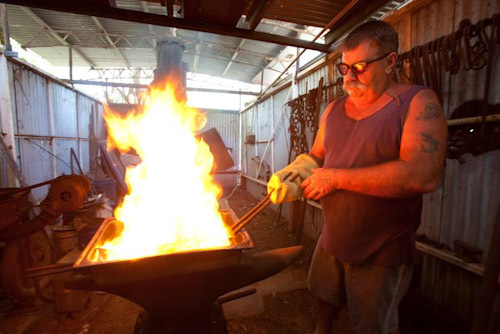 The hot steel is pounded and folded up to 360 times with a power hammer, creating beautiful patterns in the steel. 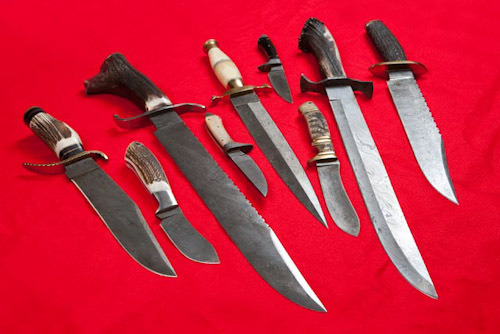 A billet (the basic long piece of unshaped steel) is then ground into the final shape, whether it be a Bowie, dagger or skinning knife. 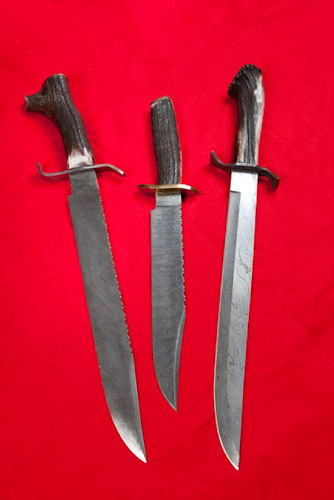 It is etched with acid and finished with a handle of deer antler, buffalo horn, camel bone or Steve's favourite, Territory ironwood. 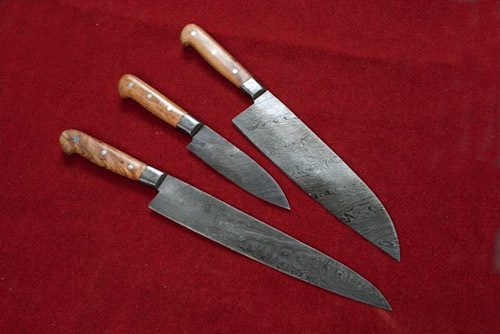 Knives made of carbon steel, hold their edge and are easier to sharpen than stainless steel. 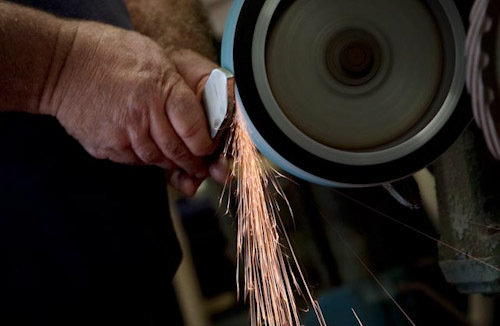 The hardness of a blade is measured in Rockwells (an internationallyrecognised system of measuring metal hardness); most of Steve Sunk's blades are rated at 56 to 58 Rockwells, while stainless steel is measured at 62 Rockwells. 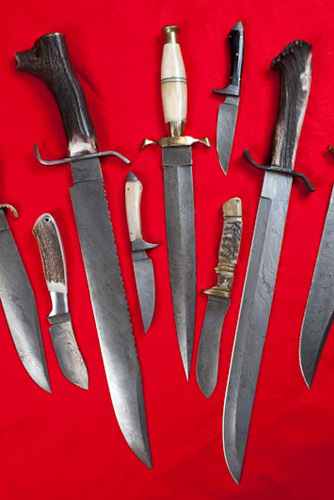 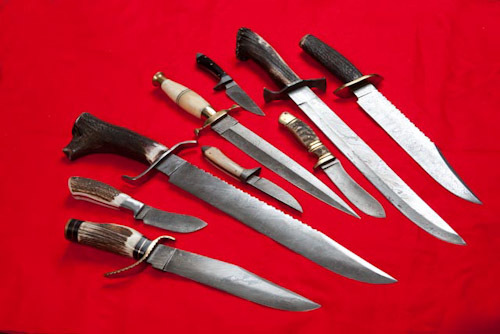 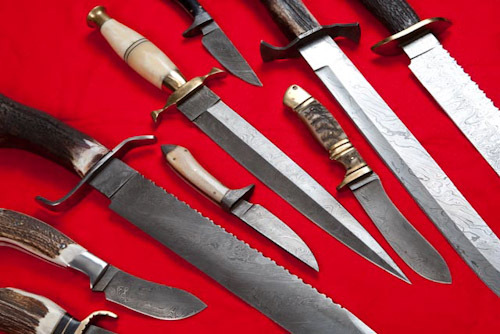 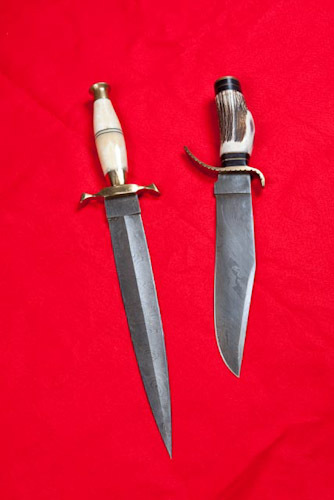 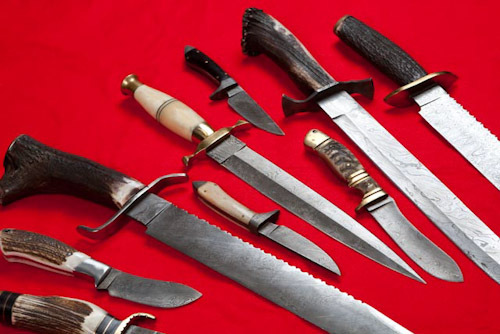 Prices for Steve's blades range from around $180 for a small skinning knife to $400 for an ornamental dagger or Bowie knife; swords range from $1,500 to $5,000. 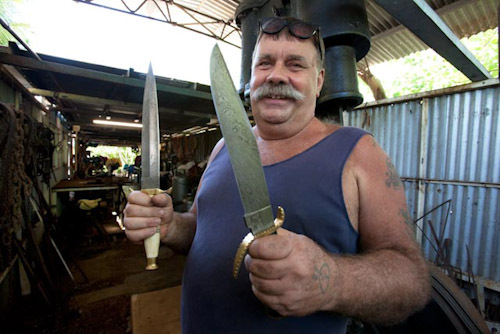 Steve also sells billets of Damascus steel to other knife-makers around Australia. 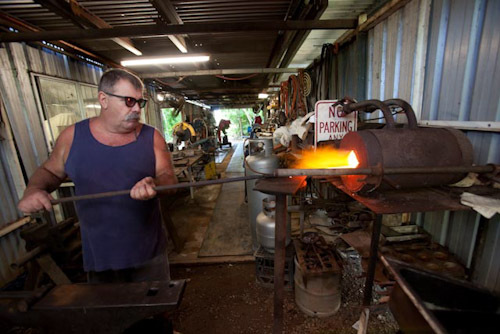 Steve began working with steel in 1986. 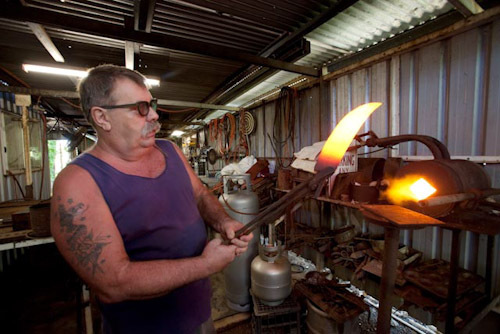 "I had a fascination with forging stuff," he says. 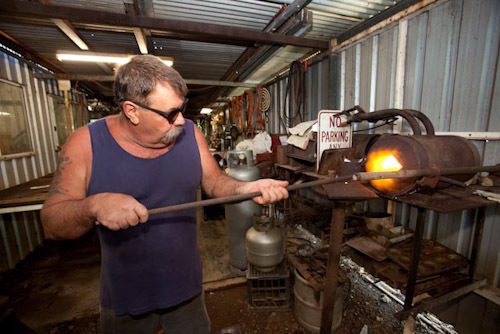 "I started with an old Australian hand forge and began making ornaments such as door knobs and metal dragons. 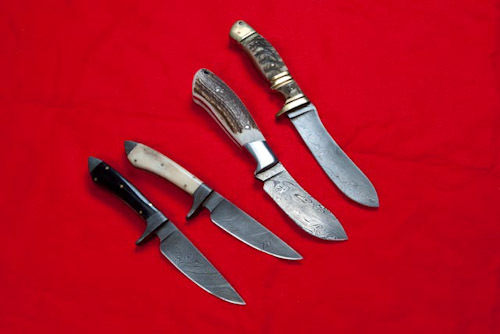 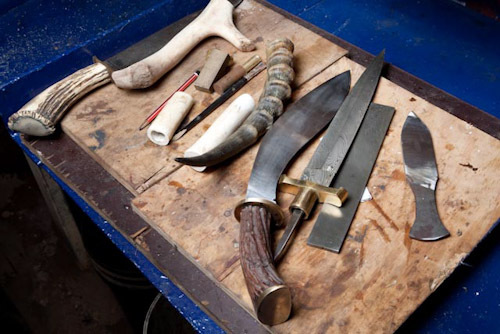 Then I started making knives – my first knives were from forged files." 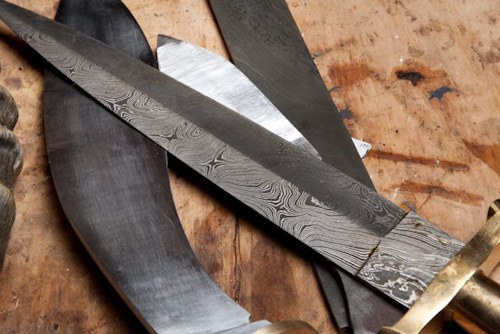 "My work became popular and I just kept it up and refined my knives more and more." 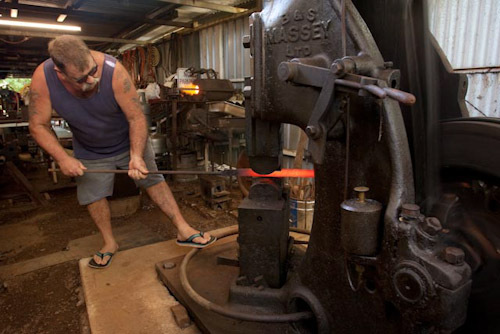 When Steve purchased a 1946 Massey steam-driven 300lb power hammer that had been lying unused in a paddock outside Adelaide he was able to start forging his own Damascus steel. 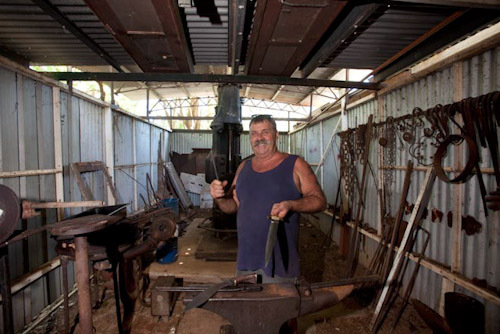 He converted the power hammer to electricity and made most of his own tools and machines. 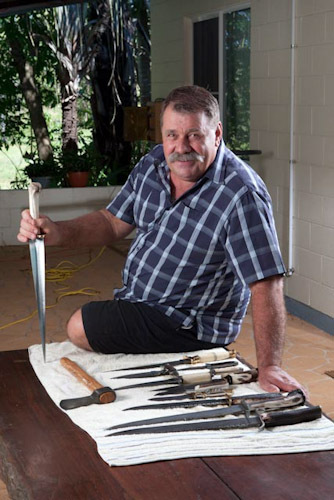 Steve Sunk admits his first passion is cooking, particularly teaching Aboriginal people how to cook, however he admits blade making keeps him sane. 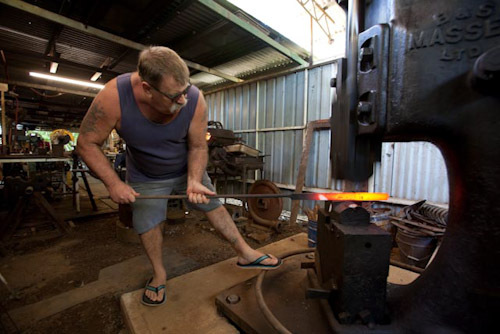 "There are times after a hard day when I just go into my shed and hammer away on a piece of steel – it's a great way to let off steam, and the stress of teaching just drains away. " 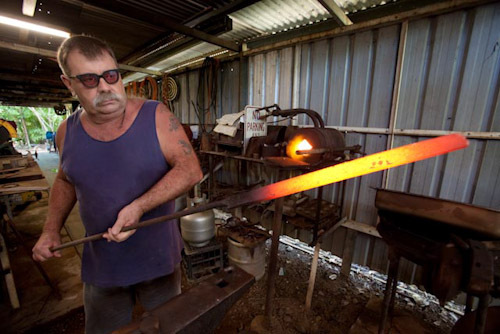 "In the end, I feel better and have produced a piece of beauty or a useful tool. 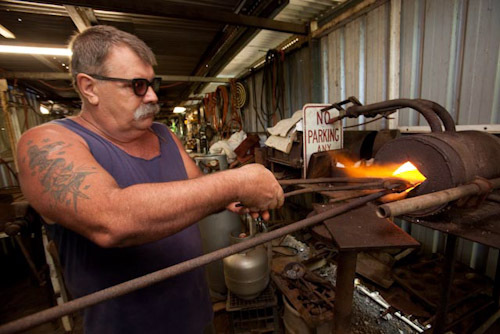 It's a great feeling."